Located 70 miles off the shores of Key West, the Dry Tortugas is a group of seven small islands and isles that provide travelers with some of the best and most pristine snorkeling opportunities in the Caribbean. 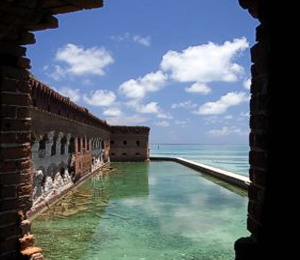 The Dry Tortugas have a unique role in the history of the United States in part thanks to its massive fort, Fort Jefferson. Fort Jefferson is the largest coastal fort in the entire country with over 16 million bricks making up its structure and taking up a total of 11 acres out of Garden Key's total of 16 acres. 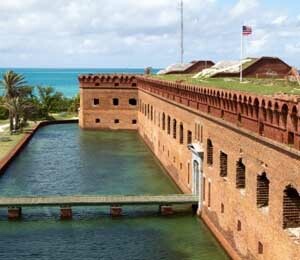 The fort was built on the islands of the Dry Tortugas due to their proximity to the Florida Straits, a passage way that was used very frequently. In Garden Key, the first structure built was the lighthouse that was used to warn sailors. In 1846 is when the construction of Fort Jefferson began. The construction of the fort was long and arduous and, even after 30 years of work and construction, the fort was never fully completed. The long process was in part due to the number of bricks that had to be delivered by boat for the construction of the fort. By the time the fort was ready for some sort of action, military battle equipment had changed and evolved, and the invention of the rifled canon made the fort almost entirely useless as a military base or fort. 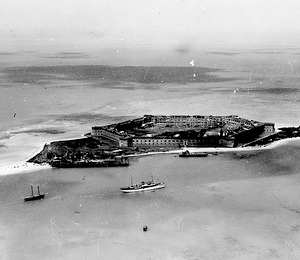 Instead, during the Civil War, the fort was used as a prison for war prisoners. Four of the men convicted with complicity in the assassination of President Abraham Lincoln were held there including Dr. Samuel Mudd. Dr. Samuel Mudd has provided Lincoln's assassin, John Wilkes Booth, with medical help while Booth was on the run after Lincoln's assassination. Most of the other prisoners included army privates and officers who were accused of desertion and other civilian prisoners accused of robbery. 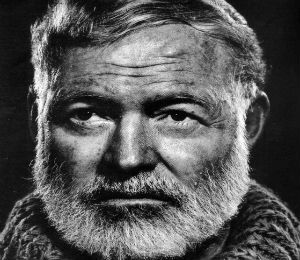 During those years, there was an epidemic of yellow fever. 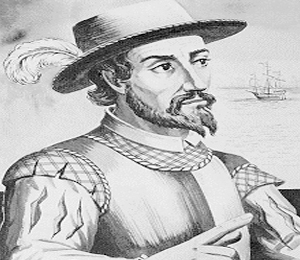 Dr. Mudd was actually able to help a lot of the soldiers and prisoners on the island during this epidemic. In part because of his useful help during the epidemic, President Andrew Johnson pardoned Dr. Mudd in 1867. By 1888, after several hurricanes, the Army gave the fort over to the Marine Hospital Service where they used it as a quarantine station. It was President Franklin Delano Roosevelt who in 1935 designated the fort a national monument. In 1970, the fort was listed on the national register of historic places. 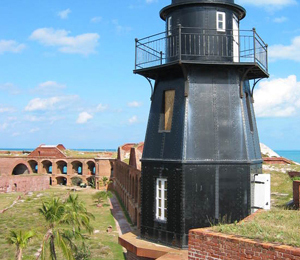 And in 1992, the Dry Tortugas including the fort were designated a national park.